Built early in the twentieth century, the Courthouse in Trinity is certainly not the first court to exist during the community's long history. Courthouse, Gaol and General Building is characteristic of judicial buildings constructed throughout Newfoundland in the early 20th century. The first reported instance of court proceedings occurring in Trinity is in 1615. At the request of the English government in an attempt to curb the amount of lawlessness in Newfoundland, Richard Whitbourne established an admiralty court. The court was not only the first of its kind in Newfoundland, but also the first in North America. Because of Trinity's widely renowned harbour, it became one of the main fishing ports in that area of Trinity Bay. While Whitbourne's early attempt at bringing a sense of law to the area met with resistance, it did not stop others from continuing the attempt. By 1732 there were three justices and five constables to administer the laws of the vice-admiralty courts. Around 1812-13 the first courthouse was built in Trinity and probably resembled courthouses built in Harbour Grace and Bonavista. However, the building was not well maintained and by the 1840s the government was receiving complaints about the structure's condition. However, it was not until the 1890s that things began to reach a dire situation. It was decided that it would be cheaper to build a new courthouse than attempt to repair the old one. The Trinity Courthouse was finally finished in 1903 at a cost of approximately $5,000. The building resembled other courthouses of that time, such as the one built in Placentia. William Henry Churchill, the superintendent of public buildings from 1895 until 1927, designed the building. Along with the courtroom, the building also housed the magistrate's offices, a jail and the postal-telegraph office. 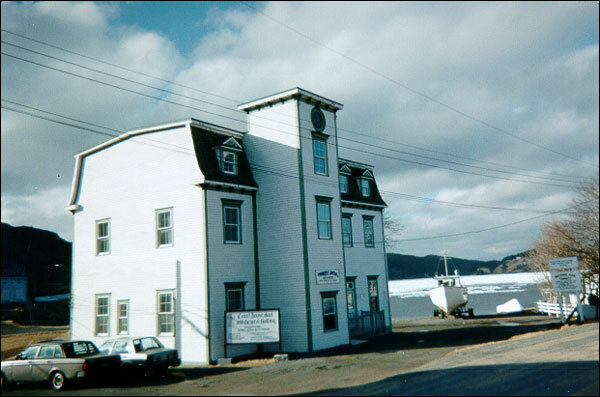 The courthouse was used for decades until the court transferred to Bonavista. Subsequently, in 1973 the interior of the building was renovated so it could be used as office space. However, the upper floors still maintain some of the features of the original courthouse. The Trinity Courthouse remains in good shape, having undergone extensive renovations at several points during its 95 years. The building was originally three storeys and made of wood with a mansard roof on two sides. A mansard-roofed tower with cresting and a clock dominated its front elevation. Since it was first built there have been some noticeable changes made to the building. The most obvious is the removal of the clock, which ceased working. The clock tower's dome was removed because rot had set in. This was done sometime shortly after Newfoundland joined Canada, probably in 1952. The interior was altered in the 1970s to allow for the construction of a doctor's office. The Trinity Courthouse became a Registered Heritage Structure in April 1998. Also view Trinity Courthouse, Gaol and General Building Registered Heritage Structure on the Heritage Foundation of Newfoundland and Labrador web site. The Newfoundland and Labrador Heritage Web Site has on its site only a portion of the registered heritage structures in Newfoundland and Labrador. To view a complete list or search for a particular structure visit the Heritage Foundation's Property Search page.